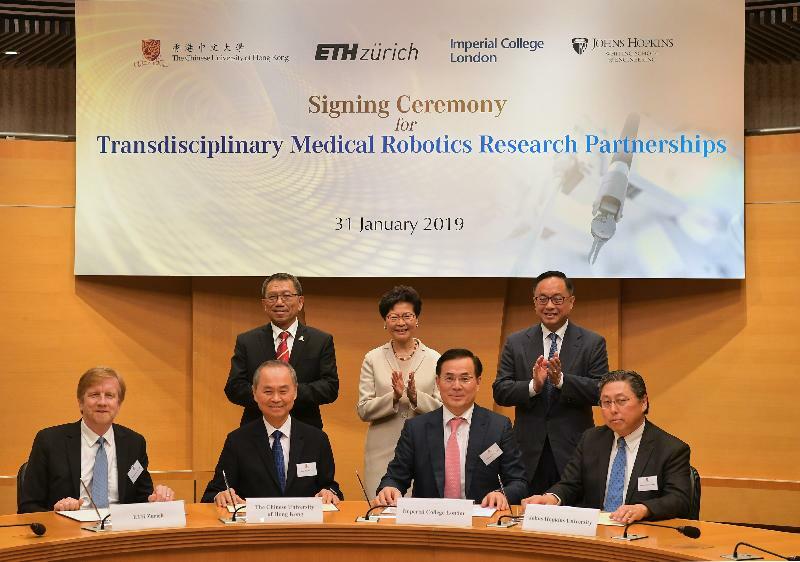 The partners in the Chinese University of Hong Kong's initiative to undertake medical robotics research are all pioneers in medical robotics, the Chief Executive Carrie Lam Cheng Yuet-ngor, said today. the Imperial College London's Hamlyn Centre for Robotic Surgery; and Johns Hopkins University's Laboratory for Computational Sensing and Robotics, are joing up with the Chinese University of Hong Kong to set up a multi-scale medical robotics center at the Chinese University of Hong Kong. The agreement for the partnership was signed today at the CUHK. The Chinese University is the first post-secondary institution in Asia to establish a robotic surgery training center, Lam said. "To date, more than 1,300 robotic console surgeons from Asia have been trained here. Recently, the Chinese University completed the world's first multi-disciplinary clinical trial of the advanced, single-port robotic surgical system. She said she was gratified to know that the research will be multidisciplinary, involving medical researchers, physicians, engineers and other specialists focused on developing robotics for innovative medical applications. Photo: Carrie Lam, back row, center, the Secretary for Innovation and Technology, Nicholas Yang, back row, right, and the vice-chancellor and president of CUHK, Professor Rocky Tuan, back row, left, at the signing of a memorandum of understanding by representatives of CUHK, ETH Zurich, the Imperial College London and Johns Hopkins University, today.